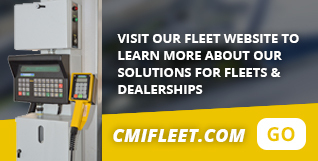 Control Module Inc. » Fleet Management Solutions - Control Module Inc.
A subsidiary of Control Module Inc., Fleet Management provides automated gates with software and ergonomic terminals to eliminate attendant costs, theft, and error. We also provide fuel management systems with software, terminals, and fuel island controls to help dealerships and fleets cut their fuel costs. Car and truck dealerships can control fuel costs and user permissions for fleet inventories. Read more. Commercial and municipal fleets can apply rules to control fuel use for specific applications, personnel, and vehicle types. Read more. Rental fleets can manage fuel use, vehicle processing, and productivity on departing and returning vehicles for various users. Read more. Automated gates can control entry and egress for different fleet vehicles and users in enclosed areas. Read more. The Fuel Island Genus terminal places all crucial attendant and vehicle information at your fingertips. With a simple key press you can log and display vehicle identification, mileage, fuel utilization, lost-and-found items, and vehicle damage. Our systems support multiple authentication methods, including Radio Frequency Identification (RFID) key fobs and vehicle tags, fingerprint biometrics, and/or barcode technology. They are compatible with several manufacturers’ gates, barriers, and gate arms. System Manager is an ASP.NET-based data collection platform for accepting terminal transaction, managing terminal software updates, loading employees, distributing data, and organizing data for distribution to terminals. The Genus series module design offers several communication methods such as direct Ethernet, Wi-Fi, Cellular, or Serial. It operates with low-voltage DC through a single local power converter or a central power supply with low-voltage power distribution to the terminals. Our system supports a variety of readers for automated data entry such as traditional barcode slot readers and hand-held scanners. It also supports RFID and proximity readers. The Fuel Island ticket printer is an industrial- grade thermal printer. It is designed to require little to no maintenance while operating in the field.